Review this section to better understand guidelines and rules related to the Center for Geospatial Analytics’ visual identity. Make sure you understand usage rules, standards and how everything works together before using these assets to create Center- and/or University-related promotions. These assets are only for official Center and University communications. Do not use them to promote private businesses or for individual purposes. The Center for Geospatial Analytics is an example of an NC State core brand extension. Core brand extensions are very closely held entities; they reflect the core brand market position and need to use the same messaging platform and visual identity as the overall institution. The brand personality is how the College of Natural Resources’ faculty, students and staff act in delivering the brand promise every day. It defines a set of human traits associated with the NC State brand and helps differentiate the College of Natural Resources’ marketing communications efforts from those of our peers. 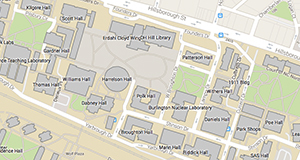 The Center for Geospatial Analytics title will always be identified by a typography treatment displayed separately, at a safe distance from and in subservient position to the College of Natural Resources logo. The typography treatments below are the primary graphic identifiers for the Center for Geospatial Analytics and are provided in several formats. The .eps files have been created as line-art vector files and are the only logos that should ever be used for print or signs. The .png files are primarily for Web use. The .jpg and .png logos can be used for PowerPoint or Microsoft Office documents. All formats can be downloaded here. * Note: With this particular PNG file, the text is white and is not set within a black brick, so it should be used with non-white background colors. If the white Center for Geospatial Analytics type treatment is to be placed over a photograph, make sure the background is dark enough to ensure legibility without altering the type or photo. Do not use the white type over a light background. In addition to the Black and White type treatments above, the Center for Geospatial Analytics has been assigned Bio-indigo and Reynolds Red as secondary colors from the expanded NC State Brand palette. These colors should be subordinate to Wolfpack Red, Black, and White. NC State College of Natural Resource’s core palette consists of three colors: Wolfpack Red, Wolfpack White and Wolfpack Black. These colors should feature more prominently than any other colors in NC State communications. We are, always, the Red & White of NC State. Even when used sparingly, Wolfpack Red should always come across as the dominant color in designs. When using Bio-indigo for the Center for Geospatial Analytics, try to use an equal amount of Reynolds Red.